Mülheim, March 15, 2016 – Turck has is now also offering a communication module with serial interfaces for its ultra compact TBEN-S Ethernet block I/O series: The TBEN-S2-2COM module comes with two serial ports, which can be individually configured as RS232 or RS485 interfaces as required. Two additional slots offer four universal digital inputs or outputs. 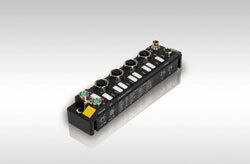 A Modbus RTU master is also integrated for the RS485 interface, which can connect up to eight Modbus devices. The new TBEN-S2-2COM modules also support Turck's multiprotocol technology and can therefore be run in Profinet, Ethernet/IP or Modbus TCP networks without any intervention required by the user. The slim 32 millimeter 2COM modules particularly simplify applications requiring the connection of digital signals in restricted spaces next to devices with serial interfaces. Thanks to its IP67 protection, the modules can be mounted directly in the machine and thus reduce the wiring effort required. All parameters of the serial interfaces, such as start-stop bits, parity or baud rate are set simply via GSDML or a parameter software such as Pactware. The power supply of the serial field devices can be set between 5 and 24 V.
Other technology modules for SSI and other interfaces will follow as part of the expansion of the TBEN-S series.